Butter is produced by churning cream until the fats separate from the liquid (buttermilk) and the butter is in a semi-solid state. Most butter sold today is from cow's milk but butter can also be produced from the milk of buffalo, camel, goat, ewe, and mares. It is believed that the Nomads first discovered butter-making by mistake. They are said to have collected milk from cattle and goats, separated the cream from the milk, and continuously mixed the cream until it turned into butter. In North America butter must contain at least 80 percent butterfat, a maximum of 16% water and 2% milk solids. 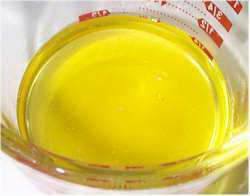 Sometimes a coloring agent (Annatto) is added to butter to give it a deep yellow color. Annatto is also used for consistency of color year round as the natural color of butter can vary from a creamy white to a golden yellow. The color depends on the diet of the dairy cow. Regions that have the richest pasture land are said to produce the best butter. Butter is graded by letter code, and sometimes a numerical number, according to flavor, color, texture, aroma and body. AA (93 score), A (92 score), and B (90 score) are the letter codes and numerical scores used. The characteristics to look for in a good butter at room temperature are that it is dense with no air bubbles, should not be lumpy, sticky or brittle, and no sweating. Butter comes in two forms salted and unsalted (sweet). Unsalted butter has a shelf life of around 3 months refrigerated because it contains no preservatives. Salted butter has a longer shelf life (up to 5 months) because salt acts as a preservative. However, salt can overpower the sweet flavor of the butter and can also mask any odors. The amount of salt added to salted butter can vary from manufacturer to manufacturer and it is hard to know how much extra salt to add to your recipe. The rule of thumb is that if you are substituting salted for unsalted butter in a recipe, omit the extra salt in the recipe (i.e. Omit ? teaspoon of salt per 1/2 cup (113 grams) of butter). Most butter has an expiry date on it. It should be stored well-wrapped in foil away from any strong odors and in the coldest part of the refrigerator. Foil is used to prevent exposure to light and air which can cause the butter to oxidize and become stale. Check your butter's freshness by cutting a small slice and the outside of the butter should be the same color as the inside. If the outside is a darker color than the inside the butter has oxidized. You can freeze butter for around six months. Just make sure you defrost the butter overnight in the refrigerator before using it. It is best not to use butter that has been frozen for baking, as freezing can affect the texture of the butter and change its moisture content. When the butter thaws it can be grainy with droplets of water. Butter adds flavor and texture to your baking and helps to keep it fresh. The temperature of the butter is very important in baking. When room temperature butter is used in your recipe this means your butter should be between 65 degrees F (18 degrees C) and 70 degrees F (21 degrees C). This temperature allows the maximum amount of air to be beaten into your batter. This creaming or beating of your butter or butter and sugar creates air bubbles that your leavener (baking powder or baking soda) will enlarge during baking. Most experts recommend 4 to 5 minutes of creaming the butter for maximum aeration. 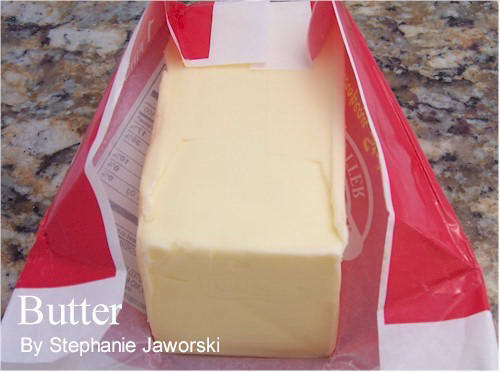 Cold butter is used in some baking (pie crusts). With this method the butter is not absorbed as much by the starch in the flour and layers result when baked creating flakiness. Whipped butter is butter that has had air whipped into it to increase its volume. It should never be used in baking. Whipped butter is easier to spread, even when cold. Note: Can substitute 8 ounces (226 grams) of lightly salted butter for 8 ounces unsalted butter, but remove 1/2 teaspoon (3.5 grams) salt from recipe. TIP: Room temperature butter means the butter should only give slightly when pressed with index finger.